Enjoy the top 45 famous quotes, sayings and quotations by Arjun Rampal. I am blessed with a good metabolism, and as long as I work out, carbs don't add to my weight. If I need a leaner, meaner look for a film, I go off carbs for a bit. The demarcation between an art house film and an entertainer has blurred, only because a larger section of the audience has accepted such realistic films. As a child, I had no idea that I would end up in the film industry. My ambitions changed from wanting to join the army like my grandfather to taking up merchant navy as a career to running for India, and finally, investment banking while I was a student of economics honour. But during my college days, I began to get offers for modelling. I am not metrosexual. I am not macho. I am normal. I don't even wear nail paint. I think it is a combination of looks, aura, success, the energies that one gives out, the person you are and the person you feel like that makes you 'desirable.' When the outside world sees you as a man who is responsible for himself and his family, as a man who is fit and sensitive, it kind of ups your desirability. If I'm sure of a person and his potential in politics, and if I know he will live up to his promises, I wouldn't mind campaigning for him. I believe in the dictum, 'never say never.' You never know, I might end up joining politics. At times, I do Tabata, a high-intensity Japanese training regimen, in which I must do 20 seconds of a specific body part with 10 seconds of rest. This must be done eight times within four minutes. Your heart rate shoots through the roof, but you burn a lot of fat. Many times an actor is stuck for the lack of choices. The same happened with me when I started my career. That was the time when mainly romantic films were being made, and that is what I was offered all the time. Want to see more pictures of Arjun Rampal quotes? 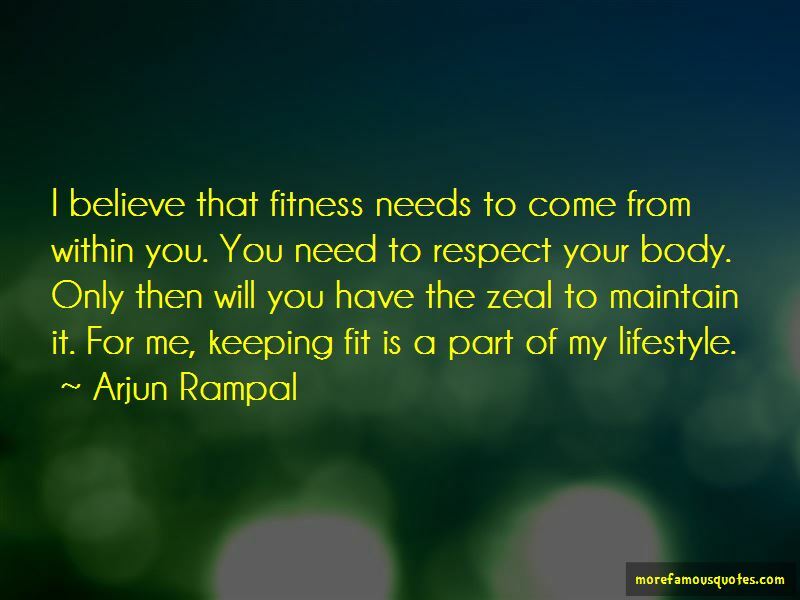 Click on image of Arjun Rampal quotes to view full size.